At the barn where Snapper lives there is a selection in all sizes. 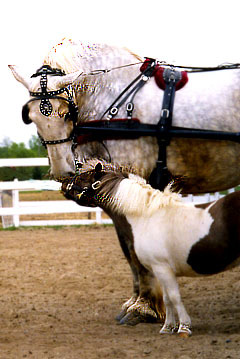 Stormy is a miniature horse, not a pony. He's very tiny, but not at all timid. You can walk him around on a lead, and he likes it. and lean on you chummily, his head by your knee. 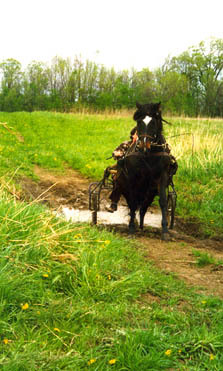 Stormy is trained to pull a buggy. and almost any passenger is too heavy. when he stops, he means it. 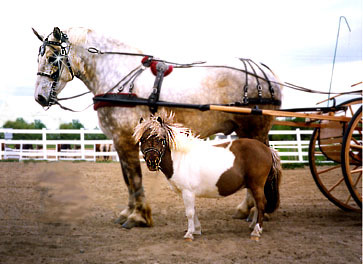 a horse in a larger size. Stormy hopes that you don't buy the buggy expecting him to pull it. Then there is Khan, a Percheron horse, nearly 18 hands tall. Khan has a double stall, but he can hardly squish into it. and Anita is helping them to get their act together. They found a very large buggy that is just a tad small for Khan. except that he is afraid to go past a field with a little burro in it. Big Khan is afraid of that burro's weird noises. Khan needs some of Stormy's courage. Stormy needs some of Khan's size. who can't see where he's going but he goes there anyway.